Speaking at the D.I.C.E. Summit, Randy Pitchford of Gearbox said that Borderlands has sold over 3 million copies worldwide and discussed his hiring strategy: don't hire "dicks." 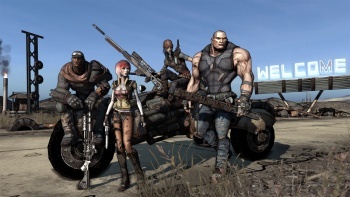 At the Design, Innovate, Communicate, Entertain (DICE) Summit in Las Vegas, Pitchford discussed the fact that Borderlands was the fastest-selling original IP of 2009. As President, CEO, and co-founder of Gearbox, he highlighted his company's aggressive DLC strategy and how he has assembled a successful design team. Pitchford also said that he keeps his employees happy with several reward systems. Pitchford said that the key to Gearbox's continued excellence at producing AAA games has been rewarding employees with programs like profit sharing in a game's monetary success, giving bonuses when significant milestones are met as well as discretionary awards based on merit alone. This seems to echo the sentiment discussed by Amy Hennig at Naughty Dog that, at its heart, the videogame industry is a meritocracy. How do you keep a team happy and drama-free in such a competitive atmosphere? It comes down to their hiring strategy, which according to Pitchford is, "No drama, no dicks, no douchebags."